Castro is San Francisco's "gay village." Bounded by the Haight Ashbury, Noe Valley, Mission, and Twin Peaks neighborhoods, the area is the home of many of the city's gay nightclubs as well as gay-owned or gay-friendly restaurants, retailers, and theaters. Don't be put off, however, if you're not gay, the area is very welcoming (if you are) and well worth exploring for its architecture as well as its eclectic menage of businesses. The neighborhood is also the site of the San Francisco Pride Parade in June and a fun and quirky Halloween street party. The Castro, also called Eureka Valley, is named for Jose Castro, a 19th century Mexican activist against US rule of California. The area's first settlers, in the early 20th century, were Norse, Danes, and Finns, and the area was originally dubbed "Little Scandinavia." Remnants of the area's Scandinavian "half-timber" construction can still be seen in many of the neighborhood's buildings. Castro's metamorphosis into a "gay village" came in the wake of the "Summer of Love" in neighboring Haight Ashbury during the summer of 1967. The movement brought thousands of middle class youth to the city and the gay population among them congregated in the Castro district. Harvey Milk, the slain gay-rights activist, had a camera store on Castro Street in the 1970s and helped to solidify the neighborhood's gay identity. The Castro Theater - The Castro Theater (pictured above), located on Castro Street near Market Street, opened in 1922, one of several California movie palaces designed by Timothy L. Pflueger. The Castro is noted for its Spanish Colonial Baroque facade, its plush interior, crystal chandeliers, and its still-operational Wurlitzer piper organ. Today, the movie house shows mostly independent films, particularly those with gay themes. 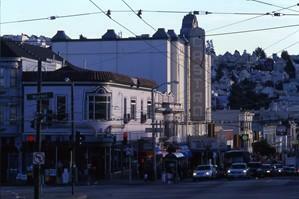 Several area film festivals, including the annual Lesbian and Gay film festival, are based at The Castro. Harvey Milk Plaza - A large plaza at the corner of Market and Castro Streets, which starts above ground and descends to include the Market Street/Castro subway station. The plaza is home to the largest flagpole in San Francisco, which flies the gay pride flag. Harvey Milk's former camera shop is located at 575 Castro Street. Cafe Flore - Located at 2298 Market St., this is the home of the AIDS Memorial Quilt, started in 1987. The cafe is a San Francisco institution and serves healthy and varied counter food for breakfast, lunch, and dinner. Blue - Located at 2237 Market St., this unpretentious diner serves "comfort food," such as mac and cheese and meatloaf. The food's great and the atmosphere is relaxed. A Different Light Bookstore - In the heart of Castro's commercial district at 489 Castro Street, this multi-faceted bookstore, features general titles as well as those of LGBT interest. Castro is easily accessible from all over San Francisco via buses, streetcars, and the subway line along Market Street or short taxi ride from Union Square or Fisherman's Wharf. Once there, the commercial district is easily navigated on foot. If you'd like to experience the area more fully, there are a few San Francisco Bed and Breakfast Inns in the area, although be aware that most cater to a largely gay clientele.